Holly House Bed & Breakfast01432 340449work Bed & BreakfastHolly House Bed & Breakfast is a Grade II listed Georgian House built in 1831. The current owners of Holly House Bed & Breakfast have lovingly bought the house back to life tastefully restoring, re-decorating and furnishing it with an eclectic mixture of old and new. The guest rooms provide guests with every modern convenience. Large comfortable bed’s dressed with Egyptian linen, en-suite shower, coffee and tea making facilities, flat screen TV/DVD, bathrobes, hairdryer, complimentary bathing accessories and Internet access. Breakfast is served in the former Drawing Room where a hearty, locally sourced traditional full English can be savoured or alternatively a healthy option offering a mixture of fresh fruits and cereals. There is also a sitting room area where guests can plan or unwind from their day, be it business or leisure. A cosy fireplace and comfortable sofas all add to our guests relaxation and enjoyment of this outstanding, individual home. Guest parking is also available. 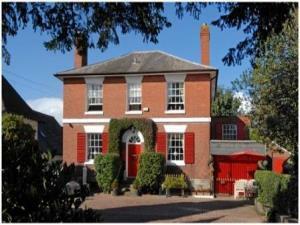 Holly House is conveniently located with Hereford city centre being a five minute walk. The train station, with links to the north and London is also within walking distance, as are Hereford Technical, Sixth Form and Arts Colleges, Hereford County Hospital and Nuffield Private Hospital. Hereford itself is steeped in history and where the city’s magnificent Cathedral is home to the Mappa Mundi. Parts of the ancient walls of the city and its gates can still be seen today. Holly House Bed & Breakfast is a Grade II listed Georgian House built in 1831. Being surrounded by the Black Mountains and on the border with Wales it is an ideal location to explore the many beautiful black and white villages or alternatively enjoy an abundance of breathtaking walks along the River Wye. Whatever your preference Hereford has much to offer the discerning traveller.